From the broadcast booth at Nissan Stadium in Nashville, Jim Nantz is talking bedding. Its midway through the fourth quarter of the Oct. 27 NFL game between the Tennessee Titans and Jacksonville Jaguars on Thursday Night Football. Along with his colleague Phil Simms, Nantz is calling the game for the NFL Network. The games a disasterexcept for Titans fansfull of miscues, muffed punts, questionable coaching, and personal fouls. By halftime the Titans are up 27-0, and the game meanders through the second half toward a blowout. With 45 drama-free minutes of airtime left to fill, Nantz tries telling a story. He explains that every morning when Marcus Mariota, the Titans starting quarterback, wakes up, one thing he always does is make his bed, even if hes staying in a hotel room. Simms responds by telling a second story, also involving sheets, pillows, and comforters. This is the truth, says Simms. Im not trying to be funny. In college, I made my bed every single day. With midnight approaching on the East Coast, Nantz circles back to the game at hand, complimenting Mariota. He doesnt play like an unmade bed, you know? Featured in Bloomberg Businessweek, Nov. 7-13, 2016. Subscribe now. For viewers who havent yet shuffled off to sleep, the exchange is unintentional comedythe weary broadcasters version of a Freudian slip. Turned on Thursday Night Football for 2 seconds, tweets one viewer. Titans beating the Jags by 30 and Phil Simms is talking about making his bed in college. Nope. Simms talking about making his bed is a metaphor for the 2016 season, writes another. This is the NFL on prime time: the greatest snoozefest on turf. Pro football, which has riveted TV viewers for decades, is now repelling them. Ratings are down across the board, particularly during prime-time games. So far this season, Monday Night Football ratings are down 20 percent from this time last year, according to Nielsen data. 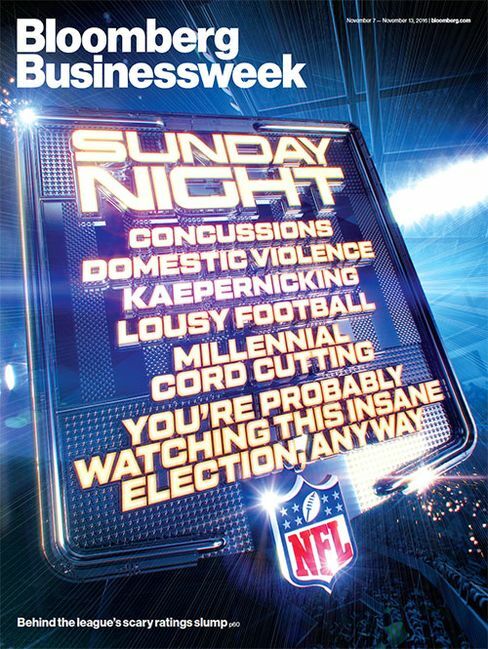 Sunday Night Football has fallen 18.5 percent. Thursday night games are down 21.8 percent. The Titans-Jaguars game averaged a little more than 5 million viewers, down 71 percent from the same week in 2015. The lackluster performance has caught various media executives by surprise. Have they sliced and diced it too much? Is there too much product out there? Leslie Moonves, head of CBS, said recently onstage at the Vanity Fair New Establishment Summit. I really dont know. Ive been surprised that the numbers are down. For years, while drastic changes swept through broadcast, cable, and satellite TV, the NFL was the exception. Executives at the countrys largest media companies could stave off investors anxiety by pointing to the unwavering strength of the league. As reality TV faltered, as American Idol cratered, as Netflix and Amazon and YouTube started diverting viewers attention away from network TV, football kept bringing them back. Even with the recent slump, football games are still among the highest-rated events on TV, but for some that only makes the decline more distressing. I just felt for so long that the NFL was unstoppable, says Patrick Keane, a longtime media executive and president of Sharethrough, an online advertising company. Its live. Its compelling. Its historical. Its only 16 games. The Super Bowl is the most watched thing in the world. It just felt untouchable. The NFLs sudden vulnerability is one of the more shocking media phenomena that Ive seen in my career. Like the clownfish and sea anemone, the National Football League and broadcast media are symbiotic creatures, deeply dependent on each other for survival. The networksComcasts NBC, Disneys ESPN, CBS, and 21st Century Foxtogether paid the NFL about $5.25 billion to air games this year. Ill tell you why its important, says sports agent Leigh Steinberg. In 1976, when I started representing athletes, each team got a couple million dollars as a share of the national TV contracts. Last year they each got a check for $226 million. 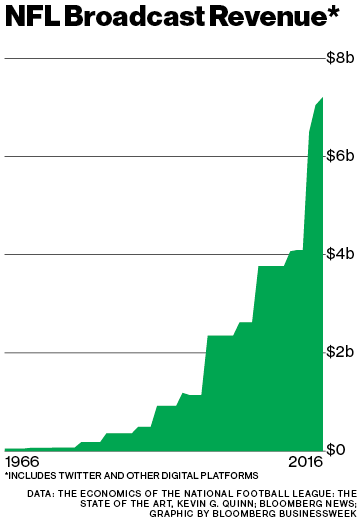 Not every penny of it was from national TV revenue. But most of it was. The multibillion-dollar valuations of NFL teams, the huge contracts for its star players, the rich sales of jerseys, memorabilia, and other merchandiseall of it, says Steinberg, is dependent on the NFLs large TV viewership. Anything that threatens it is a real concern for anyone involved in the NFL. While the NFLs plunge might seem sudden, the causes have been building for years. 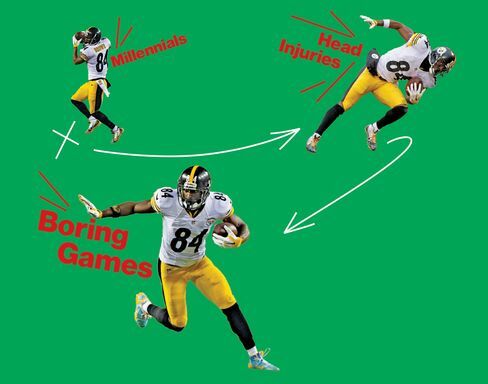 Consider the media habits of the modern NFL fan in the cord-cutting era. Not long ago, the only way to keep tabs on all the action as it unfolded in multiple stadiums every Sunday was to sit in front of a television and watch one game, no matter how lopsided or dull, and wait for the periodic scoring updates from the studios back in New York. Today, of course, all football fanseven the ones who still pay for cablehave smartphones loaded with sports news, social media, and fantasy football apps that provide real-time updates, video highlights, and stats from every game. And if fans do feel like watching TV, they can turn on NFL RedZone. NFL RedZone, which the league first offered to paying subscribers in 2009, airs on Sunday afternoons. The channel adroitly jumps among games, pulling in the most exciting moments from each. There are no ads, no interminable replay reviews by the referees, no stretches of punt, punt, punt. Its football without the boring parts. Because NFL RedZone doesnt run commercials, no ratings are available, making it difficult to judge its popularity. But football connoisseurs love it. From a consumer experience, it could not be a better product, says Sharethroughs Keane. The problem is that the NFL thought it would only really cater to hard-core fantasy football fans, and its turned out that RedZone is cannibalistic to the traditional viewing experience. The NFL has almost handicapped its own product. They are beating themselves. There are quite a few theories about why the NFLs ratings slide is happening, and if theres one person shouldering more of the blame than Commissioner Roger Goodell, its Colin Kaepernick, the San Francisco 49ers backup quarterback. In the preseason, Kaepernick began sitting down or taking a knee during the singing of the national anthem to protest police injustice and the oppression of black people in the U.S. The protests have since been adopted, in one form or another, by other players around the league, which has drawn praise from plenty of fans and sportswriters. But within the world of conservative talk radio and websites, Kaepernick now ranks up there in the bugaboo pantheon with George Soros and Benghazi. Mike Huckabee, the former governor of Arkansas and Republican presidential candidate, hopped on Facebook not long ago to blame the NFLs ratings drop on Kaepernick, and the NFL Commissioners mealy-mouthed quasi-endorsement of players imposing their grievance politics onto the game. The day before Halloween, Donald Trump weighed in. I dont know if you know, but the NFL is way down in their ratings, Trump said at a campaign rally in Colorado. And you know why? Two reasons. No.1 is this: politics. Theyre finding its a much rougher game than football, and more exciting. Honestly, weve taken a lot of people away from the NFL. And the other reason is Kaepernick. Another theory is a shortage of star power. The popularity of every sport depends to some degree on the charisma of its top performers and the intensity of their interpersonal rivalries. At the start of the 2016 NFL season, one of the leagues most popular players, Peyton Manning, was newly retired; his rival Tom Brady, who turned 39 in August, was serving a multigame suspension. A crop of once-promising young quarterbacks with a flair for the dramaticparticularly Robert Griffin III and Johnny Manzielhas largely fizzled. Impressive bed-making habits notwithstanding, Marcus Mariota vs. Blake Bortles isnt exactly Magic Johnson vs. Larry Bird. Among dedicated fans, plenty of other gripes abound. The tackling is poor. The games take too long. Its a pass-heavy league with a dearth of talented passers. By cracking down on touchdown celebrations, the league has sapped the sport of its joy. In October, during a particularly tedious, penalty-ridden matchup between the Arizona Cardinals and the New York Jets, ESPN sportscaster Sean McDonough did what every disgruntled fan does at some point: He blamed whistle-happy refs. If youre looking for reasons why TV ratings are down in the NFL all over the place, this doesnt help, he said during one agonizing interval in the third quarter. The way this game has been officiated is not something anybody wants to watch. Theres a prominent theory that, after years of trying to swallow up more and more TV airtime, the NFL is finally choking on its gluttony. Part of the games appeal has always been its scarcity. Teams play once a week. The offseason lasts more than half the year. The pent-up excitement feeds the ratings. But over time, the NFL has found opportunities to move beyond its traditional territory on Sunday afternoons. The league added games on Monday night in 1970, Sunday night in 1987, and Thursday night in 2006. The NFL now also stages a handful of games each season in London, which air on the U.S. East Coast at 9:30 a.m. In the meantime, college football has begun taking the same approach, hastily colonizing whatever nights of the week dont belong to the NFL. A few years ago, when the league expanded its Thursday night TV package, Mark Cuban, owner of the NBAs Dallas Mavericks, predicted that the proliferation would one day hurt the NFLs popularity. I think the NFL is 10 years away from an implosion, Cuban told a group of reporters at the time. Im just telling you: Pigs get fat, hogs get slaughtered. And theyre getting hoggy.Its all football. At some point, the people get sick of it. Reached by e-mail in late October, Cuban was in no mood to gloat. Nothing really to add, he responded. The data is the data. The NFL has reacted to all the hyperventilating on its behalf with reassurances that everything will be fine. On Oct. 19, Commissioner Goodell (who didnt respond to an interview request) held a news conference in Houston after the leagues annual gathering of team owners. The questions quickly turned to the ratings. Goodell suggested that the problem isnt so much that fewer people are watching, its that theyre watching for shorter periods of time. He added that he didnt believe there was any single variable driving people to distraction. There are a lot of factors to be considered. We dont make excuses, he said. Then he made a couple. Goodell acknowledged that viewing habits are changing, and said the NFL has been working to connect with fans on smartphones and other platforms. In recent years the league has experimented with live-streaming online, offering a limited number of games through deals with Yahoo! and Twitter. Those digital audiencesthough still minuscule compared with TVare growing and typically arent measured as part of the traditional TV ratings that everyone is freaking out about. Nielsen will soon introduce a metric that will eventually provide a more complete accounting of the NFLs audience, whether theyre watching on TV at home, online, or in a sports bar or hotel lobby. But for now, just enough mystery remains surrounding the leagues performance to further stoke the parlor game. Lee Berke, president and chief executive officer of consulting firm LHB Sports, Entertainment & Media, believes the drop in audience is largely illusory and that people are overreacting. Youre looking at 20 years of growth, and everybody is talking about four or five games, he says. There are fluctuations in election years and whether you have certain players around. But overall its been a substantial increase and retention of audience in the midst of virtually every other category of programming falling offfrom sitcoms, to dramas, to movies. The NFL is very resilient. The NFLs problems might not be limited to TV. After increasing slightly in each of the past three years, NFL attendance during regular-season games fell about 0.5 percent last year, to 17.5 million people, according to Street & Smiths SportsBusiness Journal. 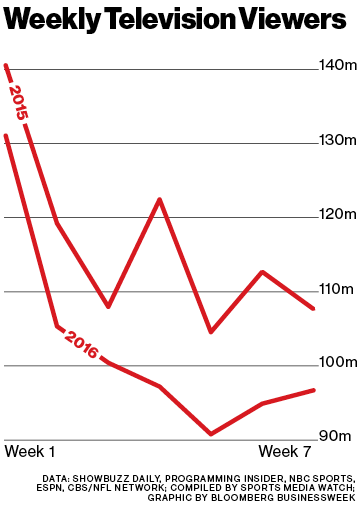 Merchandise saleswhile still strong overallare slipping relative to other sports leagues. Sales of NFL-licensed goods increased 3.4 percent, to $3.4 billion in 2015, according to the Licensing Letter, a trade publication. Thats down from 5.2 percent growth the year before; sales gains were higher for the NBA, Nascar, and even Major League Soccer. Some of the NFLs problems could stem from its rocky relationship with female fans. In recent years the NFL made a big push to court women, who make up 35 percent of its viewing audience, according to Nielsen. The NFL struck merchandise deals with apparel makers to design form-fitting jerseys, rejiggered its website to include a section aimed at women, and launched an ad campaign featuring ladies throwing their husbands jerseys in their faces and putting on more stylish, female-friendly versions. Then in September 2014, TMZ released a video showing Baltimore Ravens running back Ray Rice punching his fiance in the face in the elevator of an Atlantic City casino. The video of the assault triggered public outrage over how the NFL disciplines players involved in domestic abuse. Along the way, the National Organization for Women called for Goodell to resign. Sixteen female U.S. senators sent a letter to the NFL, criticizing the leagues policies. All of which may have undermined whatever goodwill the league had built up with female fans. According to research firm SportsOneSource, sales of womens NFL merchandise fell 30 percent during the past 52 weeks from the same period a year earlier. Some football watchers believe the steady onslaught of negative headlines could finally be driving away casual NFL fans, men and women alike. Call it football fatigue, says Steve Almond, a former die-hard Oakland Raiders fan, who in 2014 wrote a manifesto called Against Football. People like the sport, because its a joyous, escapist experience. They dont want to have their entertainment gummed up with moral issues about patriotism, and race relations, and concussions, and sexual assault. Maybe when football makes people feel conflicted and guilty, a certain small portion of viewers are like, Lets call the whole thing off. Ill go watch the Cubs, or whatever else is on. Its an innocent pleasure that has lost its innocence. When the election is over and the current fixation on cable news wanes, the NFLs prime-time audience will probably bounce back. But even if that happens, the league will still have to deal with the vexing challenge of how to keep making money when fans can no longer be trusted to turn on the TV and stay put. Steinberg, the sports agent, says the NFL should use this shudder of fear to improve its product. 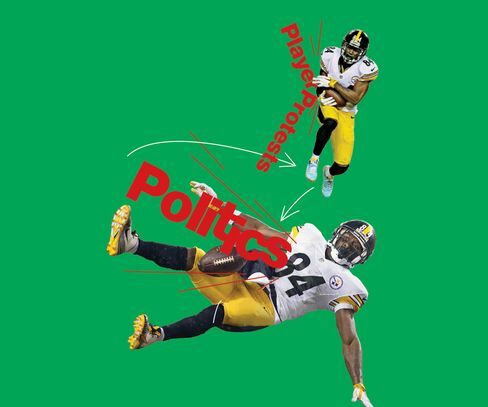 He suggests getting rid of Thursday Night Football, jettisoning instant replay to speed up games, and working out a policy where the political protests are supported but kept out of the game venue itself. There are a hundred forums to express free speech outside the stadium, he says. Its a shock to the system for a lot of viewers. The positive news for the NFL is that its TV deals give it time to figure things out. ESPNs contract runs through 2021, while CBS, Fox, and NBC are on the hook through 2022. CBS and NBC also have a deal to split the broadcast rights for Thursday Night Football, which expires in 2017. So the short-term pain isnt the NFLs problem, its the networks. Theyre already giving away commercial time to advertisers to make up for the shortfall in guaranteed viewers. If ratings stay down, the networks could be forced to lower NFL ad rates in years to come. For now, both sides are putting a good face on things. In October, Robert Kraft, owner of the New England Patriots, sat onstage at the Boston College Chief Executives Club and interviewed Bob Iger, chairman and CEO of Disney. ESPN, once one of Disneys top-performing businesses, has been losing paying subscribers even as its saddled with huge fixed costs for its live sports programming. At one point during the event, Kraft asked Iger if he was still bullish on ESPNs prospects. Iger responded in the affirmative and joked that the reason Kraft was being so friendly was because Iger writes big checks to NFL owners like Kraft. Every year, we push a button that withdraws about $2 billion of our money and deposits it in an account that youre part recipient of, said Iger. Its one of the best deals youve ever made, said Kraft.